An advertisement for the Belvedere, featuring a painting by Klimt, perhaps Vienna’s most well-known and beloved painter. 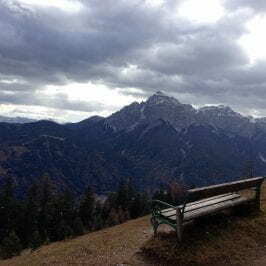 After neglecting to fully dive into the art and music that flourishes in the cultural city of Vienna, the time has come. The arts are simply huge here. Austria spends more money on the arts than its military. In 2015 Vienna alone allocated 231 million euros to the arts, while the entire country of the U.S. allocated 146 million dollars. This single city handily surpassed our entire country. On the U-bahn (subway) there are signs for operas, orchestras, etc. An U-bahn ad for an opera at the Volkstheater. Everyday when I walk to school I pass the opera house, where a horde of men dressed up as if they were in the 1800s try to sell you tickets. Scams here don’t really exist in the traditional sense, except perhaps in paying a little too much for not as genuine performances. Walking down the streets of Vienna I am greeted daily by Rembrandt’s face or Munch’s The Scream directing me to a nearby museum so I can see these famous pieces of art in person. The ratio of art advertisements is extremely high to that of other ads—I’m having a hard time thinking right now what else they advertise—mostly politicians, newspapers, and banks. Chances are, if you are walking in the first district (center) of Vienna and don’t see one of these ads, you will see a museum itself. The abundance of cultural arts here is immediately clear. What impresses me the most is the relevance and accessibility to the general populace. Art more broadly, be it visual, dance, or music, is something that the majority of Viennese are not only intimately acquainted with, but truly care about. For example, I just returned from a Strauss and Mozart concert in the Musikverein. This is an old, ornate, beautiful building in Vienna that predominantly hosts concerts. View from the standing room area in the Musikverein before the concert began. They, along with almost every other major music venue in Vienna (there are at least 7 major houses— at least three big opera houses and four concert houses, with a host of smaller concert venues), give out very cheap tickets that students can take advantage of. The majority are standing room spots, which is what I did today. I saw a show at one of the highest caliber music venues in the world, for 6 euros (roughly $6.75). The musicians’ performance coupled with the auditory quality and visual appeal of the venue made it a very memorable experience. Intricate ceiling detail of the entryway in Musikverein. You line up early before the show with your cheap ticket, eventually the doors open revealing a big area underneath the balcony and people literally run to claim a spot. Some tie a scarf on the railing to mark their place. It is amazing to me how much the populace truly cares about music. There were people of all ages in the standing room area, older women, young fancily dressed couples, a handful of confused tourists, etc. All of them braved standing for over two hours in a crowded space on a Wednesday night to listen to classical composers. It makes my heart so happy that this exists in the world. Another example of how cultured the Viennese tend to be is in their ball scene. Balls actually happen here – the kind that you think of from Cinderella (the palace in the recent movie is based off of the Belvedere palace in Vienna, just so you know) or from the fourth Harry Potter movie. People get dressed up in full-length dresses and suits and bow ties and do lovely waltzes and partnered dances. I keep thinking I am in a 19th century Jane Austen-esque story. Though ball season really picks up January onward (think again, to 19th century Jane Austen-esque traditions) there are still a few when I am here, and I will be attending two. The Staatsoper, or State Opera House in downtown Vienna. 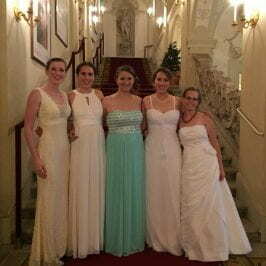 A few fellow dancers and I before the ball began at Palais Kinsky. Though I have virtually no dance experience, I jumped into this music appreciation/dancing culture and signed up to “open” a ball hosted by my study abroad program with a choreographed waltz. We have had a few lessons, and it has been both extremely fun and a challenge. I feel like I truly can glimpse what Viennese high society is like, the traces of an earlier era, with all the posturing and airs the dance takes on. I have never curtsied so much in my life, nor gotten my hand fake-kissed (which is apparently the proper way of doing it.) Anyway, it turns out balls are really something that most Viennese have experience with, and it seems that the vast majority know how to waltz. I was at a small dinner party with a few Austrians and Americans, and one Viennese guy asked the US students if we knew how to waltz. When we conveyed our lack of experience in waltzing, he was shocked, telling us that waltzing is simply something you learn growing up. Maybe not everyone is amazing, but everyone could get by. It’s just something that is expected. 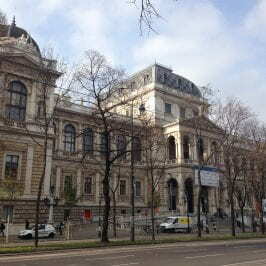 The Kunsthistorisches (Art History) Museum. Directly opposite is an identical building housing the Natural History Museum. So after reading all this about music, art and dance, you might be thinking ok, so Vienna is basically stuck in the 19th century with all this tradition and classical music. That is really not the case (at least not completely). I think that’s what amazes me most; past tradition and present rub up next to each other and live side by side. The Austrian top 50 on Spotify has lots of similarities with America’s list of top hits. Walking into stores I will hear music, almost always in English, and usually American pop music—some more modern, with a handful of songs from the 90’s or 80’s thrown in. 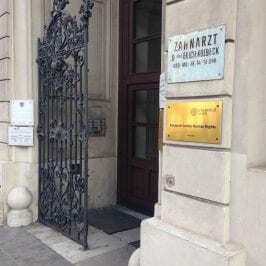 So whatever you are interested in arts-wise, be it old or newer, chances are good you can find it somewhere in Vienna!